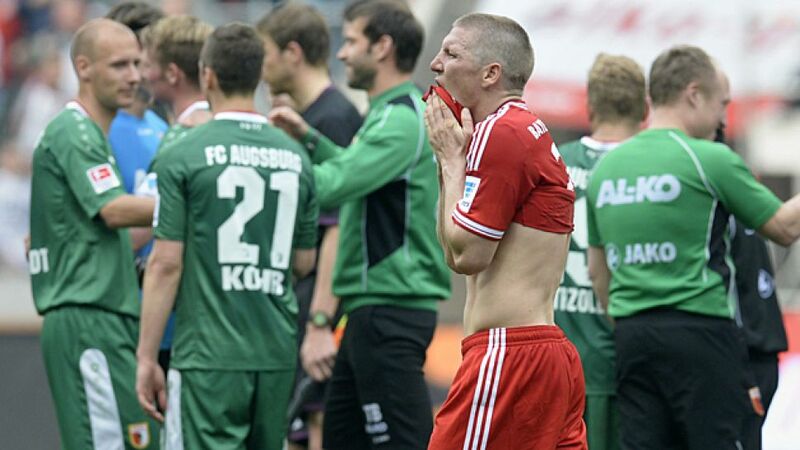 Augsburg - After 53 games and 524 days, FC Bayern München have finally lost a game in the Bundesliga. Saturday’s 1-0 reverse to regional neighbours FC Augsburg was their first top-flight defeat since they were beaten by Bayer 04 Leverkusen back in October 2012. Since winning the Bundesliga title on Matchday 27, the Bavarians have now failed to win in three games, drawing with 1899 Hoffenheim and Manchester United FC before losing at the SGL Arena. In three days' time they host the Red Devils in their UEFA Champions League quarter-final second leg, with passage to the last four of Europe's premier club competition by no means guaranteed. Thomas Müller admitted the defeat and the loss of their unbeaten record “hurt, but we didn’t produce what we’re capable of on the pitch”, while Toni Kroos surmised that “we didn’t play with enough composure to create chances and didn’t have that cutting edge”. Goalkeeper Manuel Neuer, however, freely admitted that the return game against Manchester United was their priority, not a 54th unbeaten run-out in the league. “We did take this game seriously, but the most important thing for us was that nobody got injured. Our focus is the game against Man United, nothing else matters.” Unfortunately for Neuer and Co., the defeat also claimed another injury casualty, with Xherdan Shaqiri suffering a thigh muscle tear that rules him out for Wednesday night. The Swiss international now joins the injured Thiago and suspended duo Bastian Schweinsteiger and Javi Martinez on the list of absentees for the visit of the 2008 European Champions. This latest injury setback is what makes the defeat to Markus Weinzierl’s side a costly one for the Reds, more so than the loss of the longest undefeated run in German top-flight history. Nevertheless, there were positives to take from the game at Augsburg. Guardiola no doubt feels his three youngsters are good enough to represent Bayern in the Bundesliga, and the first-team experience certainly won’t do the trio any harm. Moreover, the 1-0 reverse could prove to be the perfect result to coax the necessary response for the visit of Manchester United - a game that Pep Guardiola is now labelling “a final, a life or death game”.